Standing in the Amazon jungle, surrounded by towering trees, one can feel quite small. In such a densely wild place, trees have had to adapt and fight their way up to the sunlight. One of the Amazon’s most impressive trees would be the Brazil nut tree, which grows up to 160 ft (50 m) tall and can have a diameter of over 6 ft (2 m) at its base. Brazil nut trees regularly live over 500 years and despite the name can be found throughout the Amazon jungle from Peru to Bolivia to, of course, Brazil. While Brazil nut trees are impressive just in their size, it is their nuts (actually the seeds of the tree despite the name) that are the true stars. Known as Brazil nuts in English, the nuts are called castanhas do Pará in Brazil which literally means the chestnuts of Pará, the region where they are most common. In other regions of the Amazon they are simple called castanhas (chestnuts) and occasionally by indigenous names like juvia. Most brazil nuts exported from the Amazon actually come from regions of the Bolivian Amazon jungle. The brazil nuts form in large hard coconut sized fruit which fall from the tall trees when ripe. Once cracked open, each fruit pod holds around 8-24 individual brazil nuts. Harvesting the brazil nuts is both dangerous and difficult. The trees do not grow on plantations but rather wild in the jungle and the heavy fruit can easily kill a man as it drops from the tree tops. In the short term, brazil nuts, as an export, are a net positive in that they can be wild harvested and reduce the incentive to clear Amazonian lands for industrialized crops. High prices provide a living wage for most harvesters and encourage communities to protect these mighty trees. In fact, in Brazil it is illegal to cut down brazil nut trees meaning you will often find them standing alone in a industrialized farm field or even in the middle of a road. Long term though, brazil nut popularity could cause a serious shortage of new brazil nut trees. In heavily harvested areas, few, if any, young brazil nut trees can be found. The solution to the brazil nut problem though might be in the nut itself. In general brazil nuts are incredibly healthy, packed with fiber, protein, and vitamins like vitamin E, magnesium, phosphorus, and zinc. It is basically natures daily vitamin and in the Amazon it is often served with breakfast, just one or two nuts, like a morning vitamin might show up on your own breakfast table. Eating too many brazil nuts though is a recipe for disaster. Containing small amounts of radioactive radium and aflatoxins, which can cause liver cancer, brazil nuts are best enjoyed in moderation. With a daily suggested limit of only 2-3 brazil nuts for the average adult, there really shouldn’t be a destructive level of demand for the nuts as an Amazonian export. Thinking of how your dietary choices effect other people should go beyond supporting companies that pay a living wage or who market their organic status. You also need to think about the full ethical landscape of products. Buying brazil nuts, shipped in from half way around the world, creates an environmental footprint. Ethical wild harvesting of brazil nuts though is a way to preserve the Amazon. On the other hand, over harvesting causes issues for brazil nut trees in the long run. Buying brazil nuts supports local indigenous communities who harvest the nuts but too much demand and you encourage desperate actions like cutting down trees to collect more nuts, more quickly. Making ethical food choices is a balancing act. Understanding as much of the overall story as possible, from the way food is grown to how it might be traditionally used, can help you make the right decisions. 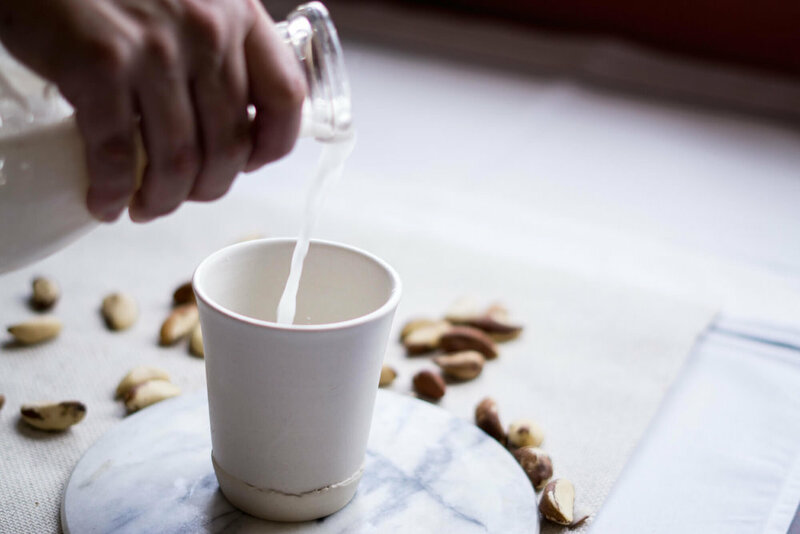 Go ahead and enjoy a few brazil nuts and try the brazil nut milk recipe below. While you do though, consider how you can find your own balance with the foods you buy, whether that be consciously considering how many brazil nuts you consume or supporting your local farmers. Cover the brazil nuts with water and soak overnight. After soaking, strain the nuts and rinse them well. Traditionally the nuts would next be grated. An easier method is to add the brazil nuts and new water to a blender and blend until smooth. If prefered, you may strain the brazil nut milk for a finer texture. Drink as is, blend with other tropical fruits for a dessert option, or use to flavor stew or soup recipes.